What do tree ear mushrooms have in common with my ears? If you ask my wife she’ll tell ya they both grow on dead wood and hear about equally. Tree ear mushrooms have a gelatinous, rubbery texture with little to no taste. (or so I’ve read, I don’t put fungus in my mouth). They’re grown commercially and often used in oriental soups. If you look you can also find dried wood-ear mushrooms for sale on-line. When re-hydrated they regain their gummi-bear texture. After the recent rain and cool temps I could have harvested a couple of pounds of fresh ears today. They seemed to be everywhere I looked in the old hemlock woods. Even if I did bring some home my wife wouldn’t have put any in today’s soup. She knows better than to trust my mushroom identification skills but I’m pretty certain I got the name of this jelly mushroom correct. This photo from an old post illustrates the ear shape better than any of the photos I took today. About a mile away on another rotting hemlock log they were brown. I would have thunk the orange ones were the younger but the white protoplasmic ooze they from is clearly seen in the second photo. That observation makes me think the brown ones may be younger but it seems the color is more a difference between colonies rather than from age. I’d like to go back and catch them after they ‘go to seed spore’. That’s when they resemble their common name. Yellowish fuzzy threads burst through the top and it all looks like a tiny ice cream cone gone bad. These are very tiny, each ball is smaller than the head of a pin. Thank goodness they grow in such numbers. 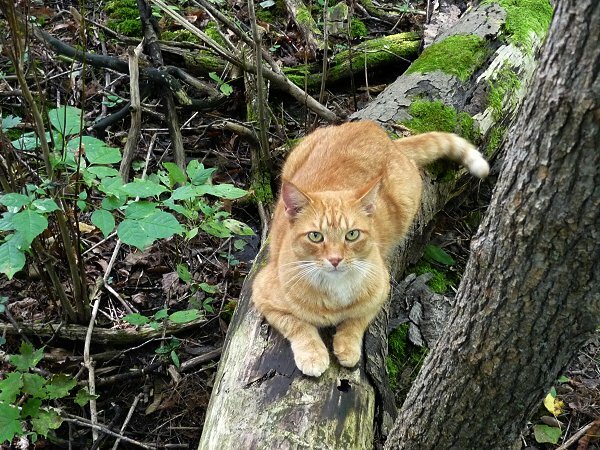 The bright orange ones can be spotted at a fair distance. I had to nearly trip over the log before seeing the brown ones. 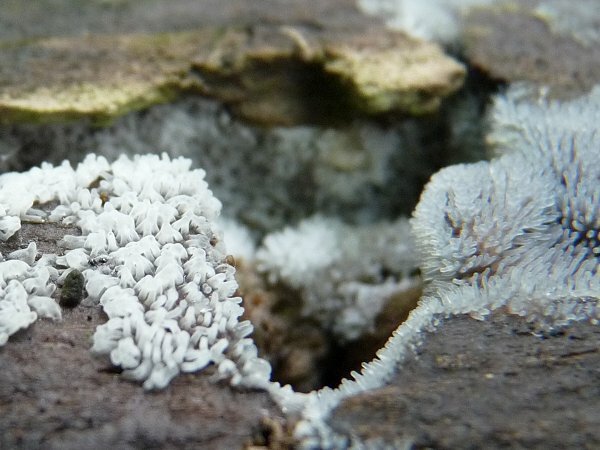 Wolf’s Milk or Toothpaste Slime Mold. 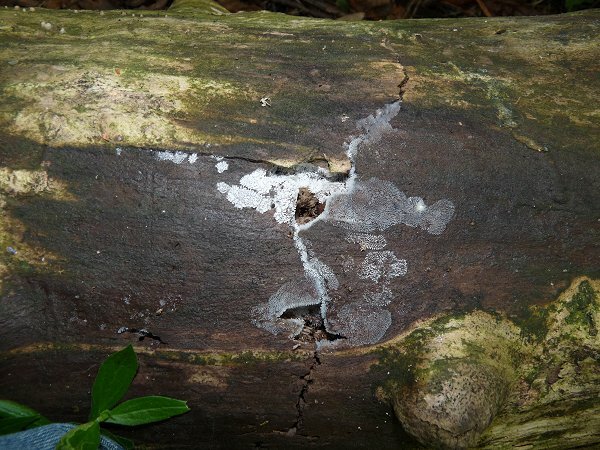 View more about my favorite log pimple on an old post – Toothpaste Slime Mold. The photos are much better on that post. I hope you can stomach them. note: the brown – yellow fuzz cone slime is all over my screen. From a distance this slime mold looked like spilt milk that had dried on the log. As I moved closer the stain began to glisten. It wasn’t dry at all. I knew before I got there that I had found more slime to add to my collection. A macro view shows different forms of growth. Some on the left look branched and are probably older that the rest. 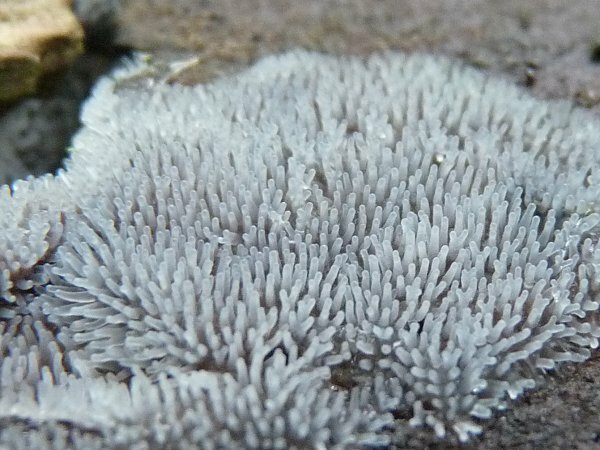 Coral Slime is normally described as looking like tiny icicles. The icy variety has been given the var. flexuosa name (branched). This specimen seems t have two different forms. Those on the right are more tube like. The ones in the cavity look like underwater sea worms to me. 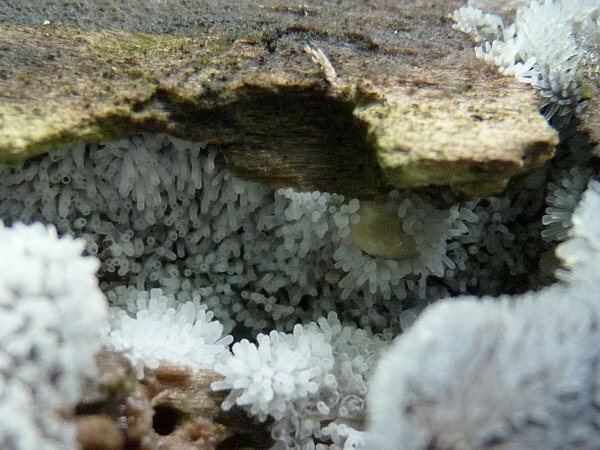 This tube form is also known as Ceratiomyxa fruticulosa var. poroides (pore like). It may not be a true variety. The difference between the forms may be the result of environmental conditions. While I played with the slime Stewy logged on to watch. From here we continued our hike and found more interesting stuff suitable for more posts. I’ll give ya a choice between a Jack in the Pulpit (with berries) growing on a stone wall or White Worm Coral as the next subject. Majority rules in the comments so state your preference. Widely distributed in North America this slime mold is supposed to be common and abundant. At least according to my Audubon mushroom field guide. I can’t remember ever seeing any but I am sure I never photographed some before today. This yummy goodness grows on dead wood and leaves. The Chocolate Tube Slime I found today was growing on a log (in a bed of Poison Ivy). The yellow/orange colored growth between them is Dog Vomit Slime Mold – Fuligo septica. I get to that another day. You have more than enough to swallow already. This is the final stage of growth. It began as a white Plasmodium mass and ended up contrary to it’s name – the chocolate tubes are dry and ‘dusty’ with spores. Notice the wood stained brown around the tubes by all the spores. I found there’s still plenty of ‘chocolate powder’ left in these tubes and got it all over my finger. Not the best macro ever photographed but it gives you some more detail with the tubes against my finger. I’ll leave you in my spore cloud. Again not the best photograph but it gives you an idea how easy it was to produce a cloud of spores. All I had to do was tickle it.